Me, hiding behind my dog. 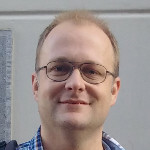 My name is Sebastiaan Janssens and I work in mathematics under supervision of my PhD advisors O. Diekmann and S.A. van Gils and also in cooperation with Yu.A. Kuznetsov at Utrecht University and the University of Twente in The Netherlands. My interests are in dynamical systems from a functional analysis viewpoint and vice versa, with a particular focus on delay equations. See my publications for more. Delay equations is also the eponym of a domain that I have registered for the plan of creating a cooperative wiki about aspects of theory and examples of delay equations. If you have expertise and would like to cooperate, consider letting me know. You can contact me via email or more email. For private communication consider using my PGP key. I am a grateful user of various excellent programs that are part of the GNU project. For online $\LaTeX$ formula typesetting with MathJax I use the Simpe MathJax plugin.